Another release from Axioo with mediatek mt6753 processors, 3Gb ram, Mali T720 gpu with 5.5 inch 720×1280 screen resolution, dual simcard and of course with 4G LTE support. This is a custom recoveries I made for this axioo venge x model, but before we continue, since not all users came here so often, let me explain first, what is custom recovery and why do we need a custom recovery. With stock recovery, our options are limited because stock recovery is meant to become a recovery mode for the manufacturer to install factory ota updates and factory resetting the device. 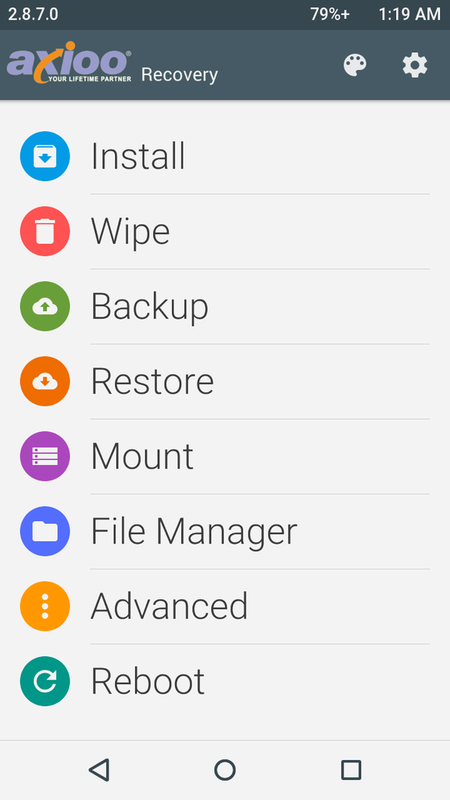 Using custom recovery, it allows you to do many things like perform several advanced recovery, restoration, installation and maintenance operations on your Android device that aren’t possible with the stock recovery, and is one of the most common ways used to gain root access, back up device data, install a custom ROMs, kernels, themes, mods and more. 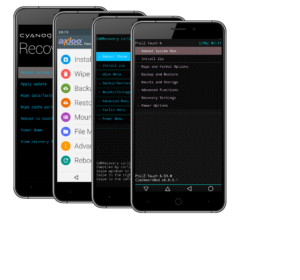 There are several custom recovery out there, but the 2 most famous is CWM (clockworkmod by koush) which now become CyanogenMod Recovery (CMR) and the other is TWRP (Team Win Recovery Project). Another custom recovery which also popular lately is Carliv and PhilZ which offer many features and possibilities to port the recovery into many chipset like mediatek and spreadtrum. Which one is better? 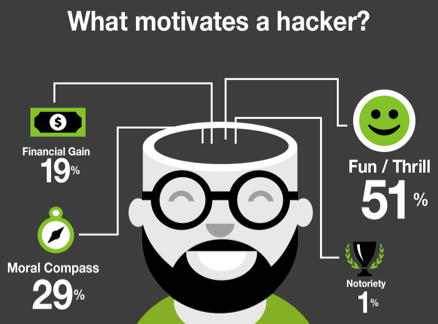 I can say all of those project are very good, they all have pro and cons. You may visit their site to look and learn their feature and limitation, don’t forget to say thanks if you use them because it means a lot for them even if you cannot donate. I think is enough, let’s continue with the real thing, here below I create four of them for you to choose, use anyone you like. Why so many variant ? well … first, because I can 🙂 and second, because it’s fun. 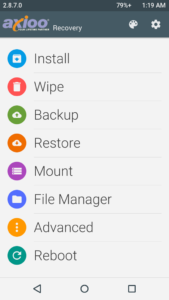 For CMR sure you cannot use it with any custom rom including mine because of OTA certificate that needs to be planted and matched with cyanogenmod certs, but since I base all of the custom recovery here from cyanogenmod build tree then I include CMR here for completeness sake. It doesn’t needs to represent that maybe someday, somewhere, someone will have a working cm port for this device, but for now the custom recovery is build successfully. For carliv recovery, there is a problem with formatting /data because on this VengeX device the userdata partition is encrypted. Other functionality works as expected, flashing custom rom zip, wipe cache, etc … however, since formatting the userdata partition is mandatory on this device, then you may not like this version. by default, this venge x stock os was using locked bootloader and encrypted userdata partition so any recovery cannot read the userdata partition for backup/restore feature. You can backup any partition except the userdata partition. Sure this is a drawback and I don’t have solution at the moment for this data backup issue, but will add on this article when some day I found a workaround. If you feel uncomfortable with this, its ok, forget this and be happy with your stock rom. To install this custom recovery, you need SPFlashTool program which only available on winblows os platform so … really sorry, I cannot support it because I never use and don’t have winblows. You may refer to this tutorial : MT65xx Flashing Tutorial it is very well explained by Bruno Martin. Please be really careful using SPFlashTool, especially when flashing ROM not for your device, since it may bricked your device forever. Of course you also can flash this custom recovery using linux or specific apk such as mobileuncle tool or recovery tool, but that’s another story. To enter the custom recovery mode is pretty easy on this model, just completely power off the device until you feel the device vibrate, indicating it was totally shutdown. Then, hold down Volume Up button then press Power button, hold them both until you see 3 menu list appear, Recovery, Fastboot and Normal. Scroll or choose between item using Vol up button and select them using Vol down button. On this case, choose Recovery and press Vol down button, wait a sec or two … then you’ll be entering recovery mode. 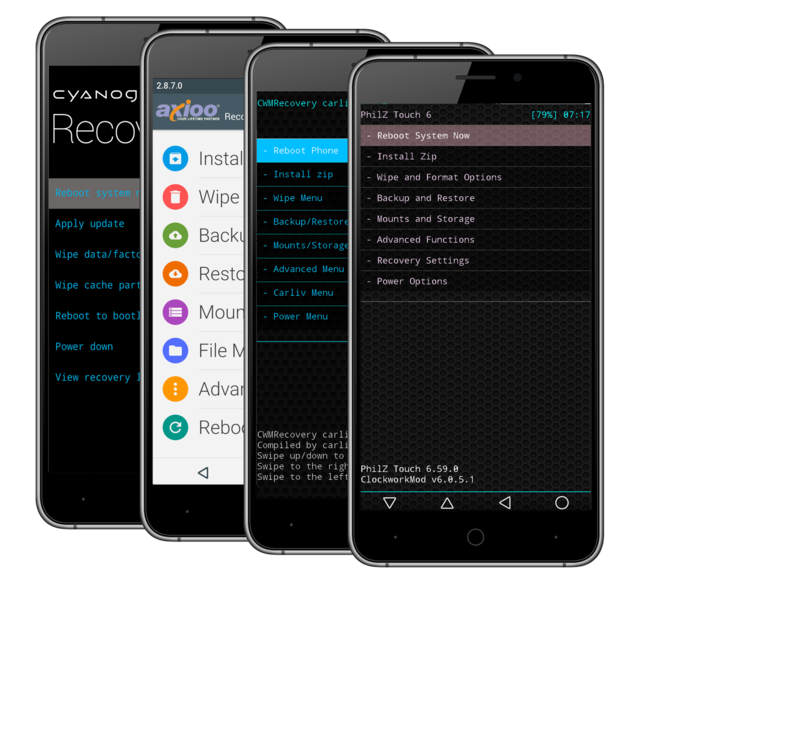 There are also many apk on playstore such as Quickboot, RecoveryTool, … etc, that can do reboot into recovery directly from alive system, use any one you like.